There’s no getting around it. Sometimes equipment breaks down. Or sometimes you need an extra system to help meet short-term production needs. Or maybe you want to pilot a new solution before committing to a purchase agreement. Fortunately, the DAF rental program lets you to keep up with production during long-term repairs, increased production and purchasing decisions. Our rental DAF systems can help reduce downtime, save on costs and maintain operations with fast installation, in-depth training and responsive, local service and support. Krofta will conduct an onsite plant assessment and develop a proposal tailored to your operations. Analyze site conditions including water, power, space and duration of rental. Evaluate wastewater to determine proper chemical conditioning requirements. Our experts will recommend a custom program designed to optimize performance and production. We’ll get your DAF rental system up and running from start to finish. Krofta will provide ongoing service and support the entire time you use the DAF rental. Experts from Krofta will shutdown, dismantle and reclaim the rental equipment without disrupting plant operations. Urgent situations are no reason to shut down the plant. But if you have a major equipment breakdown, it can often take up to three months to install or repair a system. Fortunately, our DAF rental program offers a quicker, more cost-effective solution, allowing you to keep the plant at full speed while staying in compliance. It’s simple. In less than a month we can install a temporary system and get it up and running so you can maintain production. 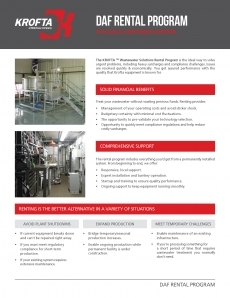 Investing in liquid-solid separation equipment isn’t a decision that’s made overnight. You want to make sure your plant gets the right solution to meet production needs and one that provides short- and long-term cost savings. Reading literature and talking with manufacturers sometimes isn’t enough. That’s why the Krofta DAF rental program lets you test equipment so you can make an informed, hands-on decision and ultimately feel confident in your purchase. Whether it’s facility construction or temporary increases in production, sometimes plant operations could benefit from additional equipment. But are these temporary setbacks worth investing in a new system? With the DAF rental program, there’s no need to purchase new equipment or let overall production slip while undergoing infrastructure construction or meeting seasonal demands.